The title of this series, Kaika ninjo kagami (Mirror of the Flowering of Manners and Customs), references kaika-e (lit. 'enlightenment pictures'), a new genre of woodblock prints that emerged in the early Meiji Period (1868-1912) to celebrate the rapid modernization of Japan. Each print in the series depicts a stylish women of the time, accompanied by commentary text on her 'modern' customs and manners displayed within a rectangular Western-style looking glass mirror. In this design, an overheated beauty leans over the edge of a suzuki-bune (lit. 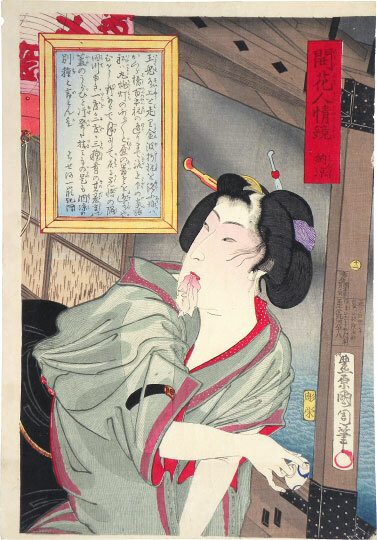 'cooling-off boat') underneath bridge pilings in order to rise out her sake cup while holding a small pink cloth suggestively in her mouth. Although the dark sky indicates the evening and the outline of her body is visible through her lightweight diaphanous kimono, she is still flush from the summer heat.